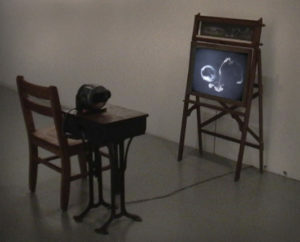 Onto a children’s chalkboard is projected a video of reverse footage of smoke rings dissolving: amorphous smoke gathers to form rings, interpreted here as zeroes. In the voiceover, I reflect on how there must have been nothing in the beginning of creation, but that this nonexistence was perhaps, like the zeroes, a sort of “nothingness” that is, in fact, “something.” After concluding that there might have been something in the beginning, I wonder if the beginning was in fact crowded, as I name all the initial creators from several creation myths. Meanwhile the smoke rings multiply.